Monday May 9 1910 Rob & Cora came out for things they needed and I gave Hattie a hen to set for her birth-day. I did some work in the garret and other cleaning. I have such a sore lung I do not feel like working. Will & Art Jones planted our corn. I went to town in the afternoon got my hat and was up in Otts office. Did evening work. 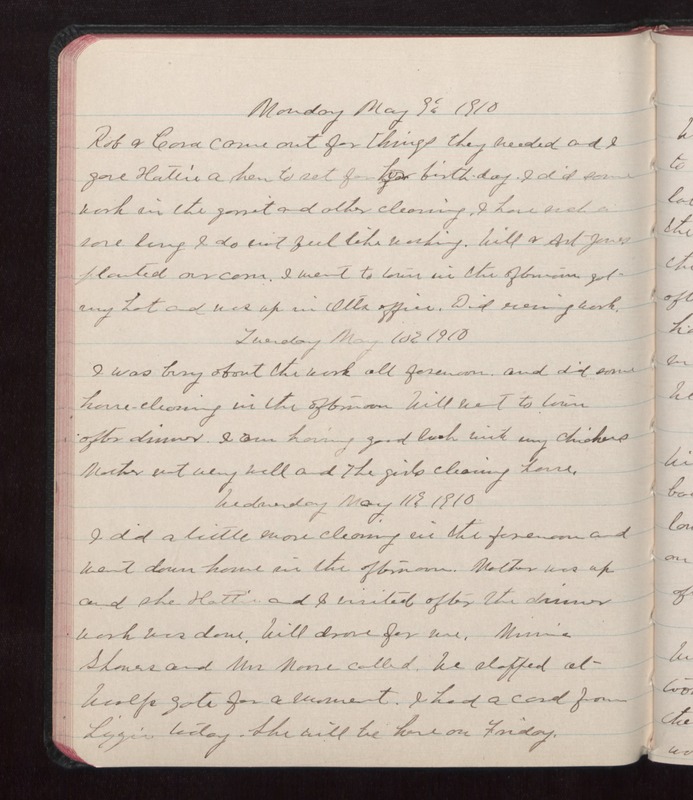 Tuesday May 10 1910 I was busy about the work all forenoon. and did some house-cleaning in the afternoon Will went to town after dinner. I am having good luck with my chickens Mother not very well and the girls cleaning house. Wednesday May 11 1910 I did a little more cleaning in the forenoon and went down home in the afternoon. Mother was up and she Hattie and I visited after the dinner work was done. Will drove for me. Minnie [Showers?] and Mrs Moore called. We stopped at Woolfs gate for a moment. I had a card from Lizzie today. She will be here on Friday.